Summer Wine & Music Series At Crossing Vineyards & Winery, 1853 Wrightstown Road, Washington Crossing, PA Performances are on Fridays, 7 pm, rain or shine. - Jun. 7 - The Fabulous Grease Band: '50s to '90s Rock 'n Roll. - Jun. 28 - The Mango Men: Rock to Pop to Country with a Jimmy Buffet Flair. - Jul. 19 - 2nd Vision: a Premier Philly Party Band. - Jul. 26 - The Real Diamond: a Neil Diamond Tribute Band. - Aug. 2 - The Pour Boys Band: The Beatles to Bruno Mars. - Aug. 9 - Still Surfin': a Beach Boys Tribute Band. - Aug. 16 - The Motor City Review: a Classic Motown Tribute Band. - Aug. 23 - Studio Two: a Beatles Tribute Band. 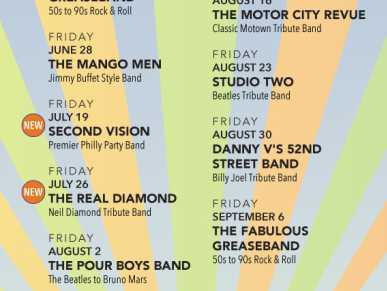 - Aug. 30 - Danny V's 52nd Street Band: a Billy Joel Tribute Band. - Sep. 6 - The Fabulous Grease Band: If you missed the first concert! Cost: $15 in advance (buy online and save!) $20 the day of the concert. Bring a lawn chair. Wine, beer, Crossing “Crushies” and light bites available for purchase. No outside beverages are permitted (BYO food is allowed for concerts). Advance ticket purchase suggested. All ticket sales are final. Performers subject to change without notice. Call for reservations 215-493-6500, ext. 19 or buy on-line: www.crossingvineyards.com. 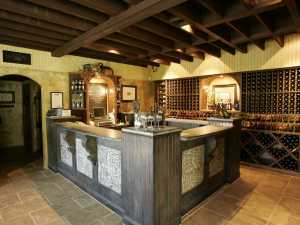 Email: info@crossingvineyards.com.